Rene Gutierrez at Taqueria No Se Hagan Bolas grabs a plastic bag from the restaurant's last remaining bundle. In front of the plastic bags, a stack of paper bags is already in place for ban on plastic bags, which goes into effect on Tuesday, May 1. AVON — An owner of Pizza One in Traer Creek Plaza met with Town of Avon employees last week to ready for the town-wide plastic bag ban going into effect on Tuesday, May 1. He left the meeting with a free bundle of reusable bags to give to customers, provided by the town in partnership with Alpine Bank. Yes, Avon’s plastic bag ban comes with a mandatory charge on paper bags, which retailers will not be permitted to absorb. Pizza One is now ready to charge the 10 cent fee with the push of a button, once they run out of free reusable bags. It’s a level of preparedness not shared by several other businesses in town. The plastic bag ban will apply to all retailers in Avon. And Avon has all variety of retailers, from City Market and Walmart, which give away millions of plastic bags per year in town, to the Haute Route outdoor shop, which only uses paper bags and ran out altogether for a few months last season without anyone seeming to notice or care. Light duty plastic bags — found by the roll in produce isles at grocery stores — will still be available. Businesses have had months to get ready, and several shops have timed it well. At Taqueria No Se Hagan Bolas, only a few dozen plastic bags were remaining in the restaurant as of Saturday, April 28. In nearby Vail, a plastic bag ban has been in effect for years, however it only applies to the grocery stores. In passing Avon’s bag ban, which applies to all retailers, the town council considered the opinion of City Market manager Jeff Gentilini. Gentilini said if the plastic bag ban only applies to grocery stores, then grocery stores get the blame for the ban from customers. “In Vail, they promised in the next year, the next phase, to apply (the plastic bag ban) to the rest of the businesses in town, and it still hasn’t happened,” Gentilini said in September, as Avon was considering the bag ban. 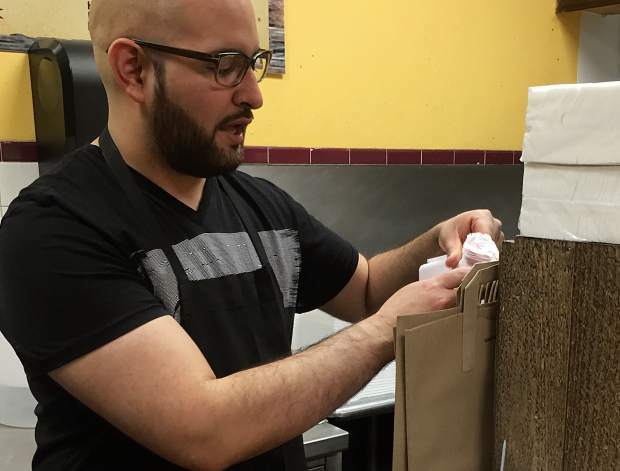 Jerry Calderon, who works the register at Beaver Liquors in Avon, said it makes sense that if a grocery store is subject to a plastic bag ban, a liquor store would be too. Beaver Liquors was down to their final stack of classic “Have a nice day” yellow smiley face bags on Saturday, April 28. Calderon has been telling the regulars to get ready for the ban.